Fashion-forward and influential Mia stands firmly on lithe, splayed legs. Available with either polished stainless steel or satin brass base, the Mia lounge chair appears light in scale but is generous in support and comfort. A tight foam/fiber back and tight seat foam/fiber with Marshall springs are standard for both comfort and resilience. 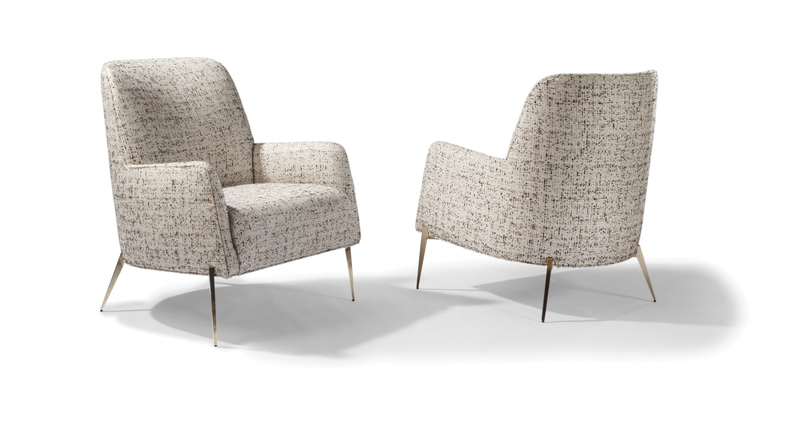 Mia's striking good looks earned her a nomination for the CDG Edward Haimsohn Design Award, honoring originality and excellence in furniture making. Choose any of our in-house curated fabrics of leathers for upholstery or provide COM. Legs are polished stainless steel. Also available with legs in satin brass as No. 1366-103-SB.